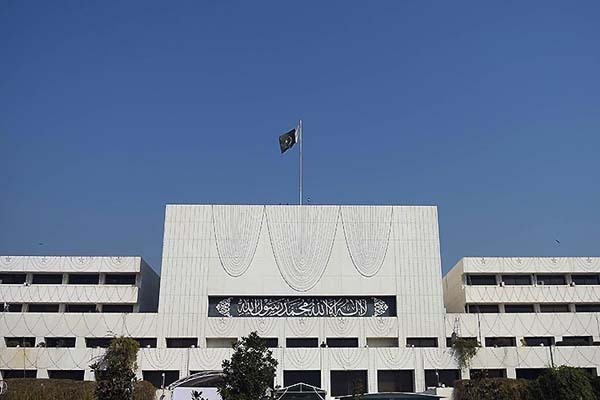 ISLAMABAD, June 20 (APP): The National Assembly on Monday approved 22 demands of grant of Rs 115,293,115,000 for Cabinet, Establishment, Aviation and other divisions for the fiscal year 2016-17.
however the House rejected all the 335 cut motions. Rs 5,641,838,000 for Cabinet Division and Rs 245,328,000 for Emergency Relief and Repatriation. Division and Rs 27,369,384,000 for its development expenditure. Rs 4,695,215,000 for its development expenditure. Development Division and Rs 2,562,237,000 for its development expenditure. demand of grant was approved for Federal Public Service Commission. of Investment, Rs 64,904,000 for Prime Minister’s Inspection Commission, Rs 8,059,014,000 for Atomic Energy Commission and Rs 91,889,000 for Stationery and Printing. CAAD and Rs 2,500,000,000 for SUPARCO, besides Rs 27,831,469,000 for capital outlay on development of Atomic Energy. to reduce the funds of these divisions for not showing up to the mark performance during the outgoing fiscal year. Naveed Qamar of Pakistan Peoples Party (PPP) urged the government to take preventive measures to avoid impending losses in the looming floods as predicted by the Pakistan Meteorological Department. by National Accountability Bureau (NAB) Chairman Qamar Zaman Chaudhry, he said the former Accountant General of Pakistan had been sacked on the same charges. The government should move to rectify the situation, he added. which were being enjoyed by those living in posh sectors. Abdul Waseem of Mutahidda Qaumi Movement criticised the government while Sher Akbar Khan of Jamat-e-Islami questioned the justification of doubling the budget of Pakistan Bait-ul-Mal despite what he called its poor performance. the Federal Capital. Capital Administration and Development Division (CADD) had failed to regularise the services of teachers serving in Federal Directorate of Education (FDE), she added. lack of clean drinking water facilities in Islamabad. under the Cabinet Division were not performing up to the mark. Ali Muhammad of PTI suggested various measures to change the attitude of bureaucrats to promote healthy and good bureaucratic culture. He said it was not easy for a person having income of Rs 14,000 to meet his expenditures. He demanded the funds allocated for the Prime Minister’s Inspection team should be cut down. providing development funds to the women parliamentarians. Award which was due in June last year but it was yet to be announced. Participating in the debate, Shehryar Afridi said hospitals in Capital lacked proper accommodation for patients and had no proper laboratories. He said there were more than 4,000 registered drugs in the market, but there was no check and balance on them. He said there was not even a single facility of clean drinking water in the Capital city. He also lamented the condition of schools. Accountability Bureau, was given the contract of Nandipur project. staff strength could impart education. and injustice still existed in the country. government should address, she added. motions was specific and should be limited to the related issue. project was faulty that was why the airport’s completion was delayed. to meet its day to day operations.